Wisconsin native Chris Kroeze performs on the season finale of NBC’s ‘The Voice.’ Kroeze, who finished second during Season 15 of the show, will perform Saturday night at Big Foot High School in Walworth. Wisconsin Supreme Court candidate Brian Hagedorn speaks at a news conference Wednesday. Hagedorn held a margin of less than 1% after Tuesday’s state Supreme Court election against Lisa Neubauer. Conservative Brian Hagedorn’s strong showing in Wisconsin’s Supreme Court race cheered state Republicans on Wednesday, with their first positive result in a statewide election since 2016 suggesting reasons for optimism next year in a critical presidential battleground. Hagedorn led liberal-backed Lisa Neubauer by 5,962 votes—less than half a percentage point—in a race that could still go to a recount. But it came after a string of losses by Republicans in special and statewide elections since Donald Trump carried the state. Neubauer didn’t immediately say whether she would request a recount. It would be difficult to overcome such a large margin, and a recount would come at her expense. She immediately appealed to supporters for money in case she pursues the recount. Counties have until April 12 to report final vote totals, and Neubauer has three days after that to request a recount. The Wisconsin Supreme Court has been the deciding force in several partisan battles over policy in recent years and is itself clearly partisan—conservatives hold a 4-3 edge. Democrats had hoped Neubauer would capture a seat currently held by a liberal justice, maintaining that margin but positioning them to win the majority in another election next year. Turnout was nearly 27%, well above the 22% of last year’s state Supreme Court race. Hagedorn overcame Neubauer’s huge margins in the liberal strongholds of Madison and Milwaukee by running up the vote in Green Bay and more rural parts of northeastern and northcentral Wisconsin. Those are both parts of the state that helped fuel Trump’s win in 2016. Wisconsin recounted its presidential vote in 2016 at Green Party candidate Jill Stein’s expense. In that recount of nearly 3 million ballots, only 131 votes were changed—in favor of Trump. Neubauer, in a recount of just 1.2 million ballots, would have to pick up 45 times as many votes. The 2016 presidential recount cost local election clerks $2 million—more than the $1.7 million Neubauer raised during the entire campaign through March 18. However, those costs included overtime for clerks who had to count nearly 2.9 million votes under a tight deadline. Deb Cmar, right, dances with her granddaughter Graclyn Miller during the intergenerational story time offered by Hedberg Public Library at Oak Park Place senior living facility in Janesville on Wednesday. Shannon Tollefsrud, in blue, helps act out songs with a bean bag during intergenerational story time offered by the Hedberg Public Library at Oak Park Place in Janesville on Wednesday. Oak Park Place employee Jennifer Donahue, left, plays with a resident during intergenerational story time offered by Hedberg Public Library at Oak Park Place in Janesville on Wednesday. Emma Trainor and daughter Violet Trainor during intergenerational story time at Oak Park Place in Janesville on Wednesday. Amanda Maechtle and daughter Jocelyn Maechtle during intergenerational story time. It was the best entertainment ever. That’s usually the case when a group of toddlers gets together for story time at the Hedberg Public Library. On Wednesday, the entertainment value went up because story time was held at Oak Park Place, a senior living facility in Janesville. Oak Park Place residents sat in a wide circle. Toddlers and their adults—moms, dads, aunts, grandmas or grandpas—sat on quilts in the middle of the circle. In this case, however, “sat” is a placeholder verb for a variety of other activities. One little guy wandered off for a tour of the outer circle, looking curiously at the new additions to story time. Some of these new people had white hair. Others sat in wheelchairs. And they were all smiling at him, as though he was the center of the universe. For toddlers, being the center of a smiling universe is like winning the lottery. The change in venue was because of the library’s remodeling schedule. Starting Monday, April 15, the library will be closed until noon Monday through Friday. From now until May 8, story time will be held at 9:30 and 10:30 a.m. It went so well, they’re thinking continuing intergenerational story time even after remodeling is done. Hedberg Public Library Youth Services Associate Shannon Tollefsrud said the children who regularly attend story time were a little uncertain about the setting but soon got over it and began to make friends. Kids, too, benefit from the interaction with older folks. “We know that children are more ready for school when they’ve had a variety of diverse experiences,” Westness said. Toddlers make it OK to put bean bags on your head—even after the special song about putting bean bags on your head is over. That’s because a bean bag on your melon will make a toddler smile. And a toddler’s smile is like winning the lottery. 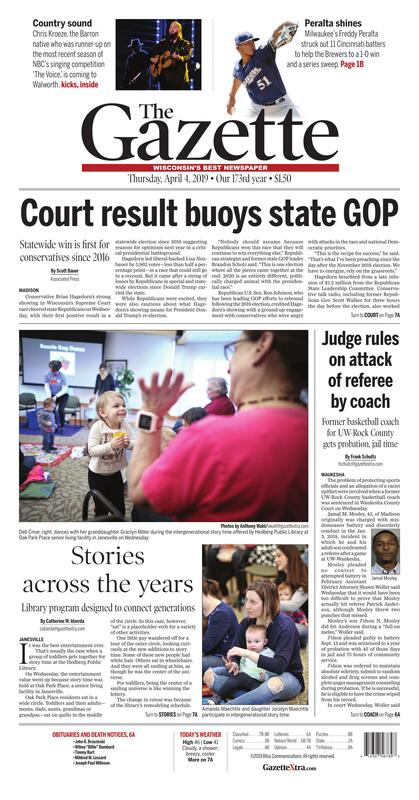 The problem of protecting sports officials and an allegation of a racist epithet were involved when a former UW-Rock County basketball coach was sentenced in Waukesha County Court on Wednesday. Jamal M. Mosley, 42, of Madison originally was charged with misdemeanor battery and disorderly conduct in the Jan. 3, 2018, incident in which he and his adult son confronted a referee after a game at UW-Waukesha. Mosley pleaded no contest to attempted battery in February. Assistant District Attorney Shawn Woller said Wednesday that it would have been too difficult to prove that Mosley actually hit referee Patrick Anderson, although Mosley threw two punches that missed. Mosley’s son J’shon N. Mosley did hit Anderson during a “full-on melee,” Woller said. J’shon pleaded guilty to battery Sept. 13 and was sentenced to a year of probation with 45 of those days in jail and 75 hours of community service. J’shon was ordered to maintain absolute sobriety, submit to random alcohol and drug screens and complete anger management counseling during probation. If he is successful, he is eligible to have the crime wiped from his record. Woller noted a steep decline in the number of officials for high school sports in Wisconsin and quoted the National Association of Sports Officials, saying a major reason officials quit is poor treatment from parents, fans, coaches and players. Woller said society values sports programs for the values they instill in young people, so it’s important to protect officials. Anderson spoke, asking for the harshest possible punishment. Anderson said he has officiated for 33 years, and this incident happened after a game, when a coach is supposed to show sportsmanship by shaking hands with opponents. “Instead, he’s chasing me off the court, grabbing my arm and demanding respect,” Anderson said. “My father taught me respect: ‘Respect your elders.’ I know what it is. I think his definition was that I was to fear him, and when he saw that I didn’t, he was enraged,” Anderson said. Anderson said bruises on his head should be enough to prove Jamal hit him. The criminal complaint also describes a black eye. Defense attorney Anthony Cotton said Jamal has gotten counseling, has no prior criminal record, has been employed all his adult life and has been supportive of his wife of 15 years as she moved from place to place in the U.S. Navy. Jamal’s reputation is destroyed, and he has lost his ability to do what he most valued—to coach young people—as well his main source of income, which amounts to “extraordinary punishment,” Cotton said. Jamal always got rave reviews from his players and parents, Cotton said, arguing that the incident was out of character for him. Jamal was reacting to what he interpreted as a racial slur from Anderson during the game, Cotton told the court. Cotton acknowledged afterward that the word was “boy,” long recognized as a racial epithet when applied to a black man. Jamal recently was accepted into a program at UW-Madison to get a degree in African-American studies, and he hopes to become a professor, Cotton said. “He’s very conscious of racial issues. He has worked very hard to overcome racism in his life,” Cotton said. Judge Michael Maxwell said Jamal “failed miserably” at doing his job that day, which included being a role model for his players and his son. But Maxwell acknowledged the many positive things Jamal has done in his life. Maxwell said he has seen worse examples of attempted battery, and he could not impose the maximum sentence. “I don’t think you are a bad person. I think that particular day, you made a bad decision,” Maxwell said. Maxwell ordered one year of probation, to include 30 days in jail with work release, as well as 50 hours of community service and anger management treatment. Maxwell said he had to send a message to the community, that such treatment of sports officials will not be tolerated. Maxwell said he believes Jamal has a good character. “Everybody gets upset sometimes, but it’s how you react to those circumstances that makes all the difference in the world,” Maxwell said, and as a coach, Jamal was held to a higher standard. Jamal said after the hearing that Anderson used a confrontational tone during the game and refused to give his name, so Jamal followed him after the game to get his name because the score sheets, which include officials’ names, were not available. Anderson was not available for comment after the hearing.